(Iglesia Bautista Danto) Danto Community Baptist Church Being Built! What started two years ago with a visit to Pastor Gabriel and the church that met on his front porch has turned into a vision of Concord to build a building in the El Danto community in Nicaragua. A private donor challenged the church to raise $5,000 and he would match it for the building of this church. The community will be encouraged, and Pastor Gabriel is encouraged. "My dear Pastor Dennis. God bless you. We are so grateful to God, you and your beloved Church. God is doing great things. These are pictures of the Church of Danto. We are all happy and working. Pastor Thanks for your prayers, for your love and support. You have blessed us so much. We Praise God for you, your family, church and ministry. And a big hello to all brothers. We love you." Tomasita is a young girl from the community of La Carreta. She goes to pastor marlon’s church, which is one of the satelite churches under Principe de Paz in Somotillo. In May, we showed the Jesus movie about the crucifiction and death of Jesus Christ. We shared the Gospel and made an announcement about the Clinic. That night, Pastor Hidalio made an invitation for people to come to Christ, and that night, 8 people received Christ. Weeks later, Tomasita came to the clinic for a doctor’s visit and told me that that night she had received Christ but hadn’t come up to the front because she can’t walk. Seven years ago, she was diagnosed with rheumatoid arthritis that is deforming her hands and feet. So that day, I prayed for her in healing and changed the treatment regimin she was receiving. We talked a lot that day. It’s been a couple months since then, and the change in treatment has helped her improve a lot. Without a doubt, God is working in her life. She was a very sad woman before, and now she smiles. The most moving thing about this story is that she used to talk onlya little about her family, she only told me that she had never had a boyfriend, and didn’t think she would get married, because with her pain, no one wanted to be with her. This last month, she came to the clinic with her dad and a very kind looking man and I asked her father, “how does your daughgter look to you?” He said she looked good and that she had improved greatly, before, we carried her around in our arms and fed her, but now she is able to do it by herself. We are completely sure that this happened because of the faith that she has in God. She was smiling and said to me, “doctora, my parents received Christ a week ago and now I am completely happy.” My eyes were filled with tears to see this girl who was only about 30 years old, who, after so much pain, had found peace. God uses any circumstance to remind us that we don’t have to worry about our problems because we have a great God. No one could imagine the suffering and pain that this girl was going to have such a problem and that from it would come an amazing story of healing and confirmation that God is faithful and just to those who follow him. In the love of Christ, I ask you for your prayers for me and the clinic team, that God would continue using us to build his kingdom. Concord Baptist Church is blessed to be in partnership with Opportunity Missions in Somotillo, Nicaragua. Pastor Dennis, Mike Stokes and Dennis Hightower explored Nicaragua in January of 2013 and God spoke into their lives the need for Concord to be involved with Pastor Diomedes Santilez in Somotillo, Nicaragua. Pastor Diomedes is a man with a great vision of reaching his country for Jesus Christ. He inspired our Pastor to be intentional about making disciples. 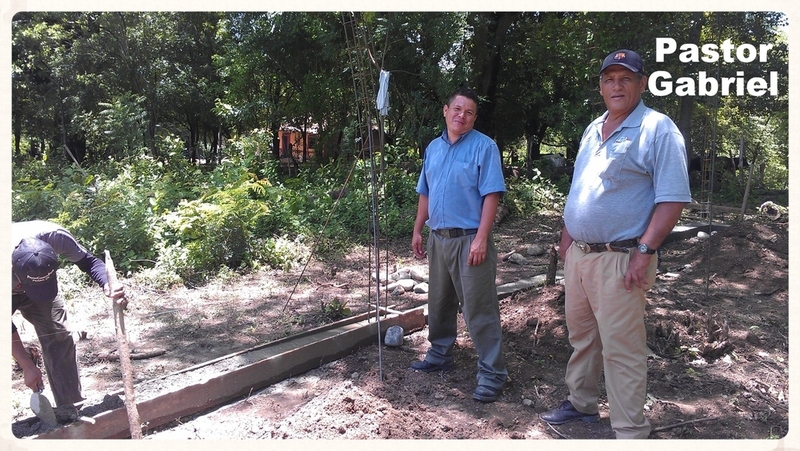 Pastor Diomedes has been involved in starting over 45 churches in the Northwest region of Nicaragua. Pastor Diomedes' ministry flows over the border into Honduras, where we helped build a church in the town El Triunfo. We are excited to be a part of helping churches be established in their communities and we are going to continue to adopt new communities in the future. We are also excited to partner with another church and support Dr. Karla Escalante to work in the Medical Clinic in Somotillo. Can you imagine your family physician working for $50 a day, but that is all it takes for Dr. Karla to share the Gospel with every patient that she sees. This is God's working and we want to be a part of what He's doing. Children at a house church in Nicaragua. Missionary Showing us the new Medical Clinic in Somotillo. Agustina Paz 42 years came to the clinic with Bronchitis symptoms after suffering for 10 days. She did not go to the doctor because she did not have the money to pay for her medicine. Finally, she managed to come to see us and we solved the problem providing her medication through the donations that Stephanie had in stock. Three days later she returned feeling well, she is from Honduras but she lives in Somotillo and since that day she has brought with her more people from Honduras to the clinic. Dr. Karla Escalante hugging a patient. Domingo Varela is 43 years old. He has been attending a baptist church at a community called Los Jovitos and he has a daughter who suffers physical abuse by her husband. The husband does not allow her to attend church or visit her parents . Her mother Mrs Dominga is praying everyday for her to receive the lord Jesus Christ and stay away from that man who physically abuses of her. Ten days ago the young woman's husband was drunk and hurt another man beating him to death. The husband fled the country and has not been found. The girl moved back to her parents house and she is now attending church with her mother. Her mother feels that God answered her prayers. Please continue praying for Nicaraguan people for God to lead their lives, its incredible the violence cycle that people live in this area of our country.